The third-generation iPad will be available at Apple's retail stores and the company's online store this Friday at 8 a.m. in the U.S., Australia, Canada, France, Germany, Hong Kong, Japan, Singapore, Switzerland and the U.K. It will also be available in Puerto Rico and the U.S. Virgin Islands. In addition to Apple's retail stores, the new iPad will also be available in the U.S. at Best Buy, Radio Shack, Sam's Club, Target and Walmart on Friday's launch day. 4G LTE versions will also be available at AT&T and Verizon retail stores in the U.S.
Officially announced a week ago, the new iPad has a high-resolution Retina display powered by the new A5X chip that features quad-core graphics processing. The third-generation tablet also sports a 5-megapixel iSight camera with advanced optics capable of recording 1080p video. The new iPad also offers a 4G LTE model capable of connecting to high-speed data networks in the U.S. and Canada, as well as 3G networks around the world based on HSPA+ and DC-HSPDA. 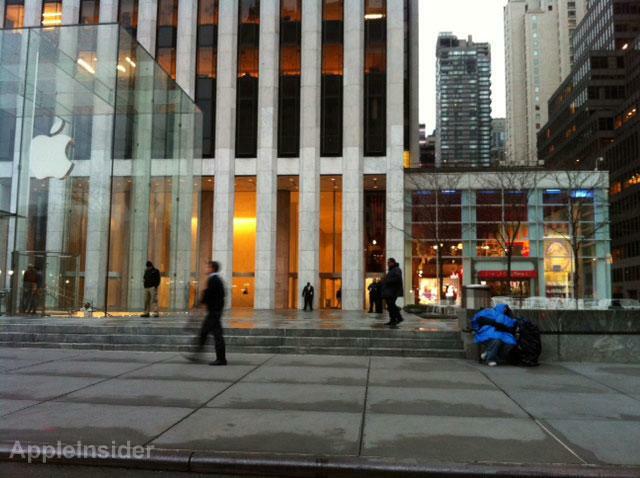 The first iPad customer in line at Apple's Fifth Ave store. Photo by AppleInsider reader Ryan. In addition to the new iPad, Apple has also continued to sell last year's iPad 2 in a capacity of 16GB, starting at $399 for the Wi-Fi-only model. A 3G-capable version is also available for $529. New iPads purchased at an Apple retail store come with free "Personal Setup" service, which helps customers customize their iPad by setting up e-mail, installing software from the App Store and more. Apple also offers its "Personal Pickup" service at U.S. retail stores, allowing customers to shop and buy from anywhere, then pick up their purchase at any retail store.